When my daughter, Sarah, was home from college during the fall, she had an interesting experience in our house. It was mid-morning, she was comfortably dressed, eating breakfast and watching HGTV in our living room. She heard a delivery truck pull up, heard someone walk up the steps and then, after they placed the parcel on the porch, heard the doorbell ring. A few moments later, the truck drove off. Then she opened the door, picked up the parcel and looked around. She realized there were no cars in the driveway, which also made her realize that she was the only one home. Sarah sat on the front porch for a while, not ready to go back into the house. But, because it was November in northwest Illinois, she soon made her way back in. She said it wasn’t a scary voice – only protective. A ghost who watched over her. I wondered if that happens a lot – so I asked Reddit. This is a story I do not often tell. I promise, sincerely, that this has scarred me for life and although I have looked into psychological explanations for what I heard and natural explanations for what occurred, they remain unsatisfactory. When I was a child, I was scared of the dark. I swore to my mother I heard voices in it. They were not evil, but they were not familiar and so they scared me. It was not uncommon in the middle of the night for me to wake up and hear “whispers” as I would call them when asking my mom. She figured they were just “bumps in the night” and typical kids nightmare material. I tried often to explain to her that it was more than that, that they sounded different from one another the way people’s voices do. On some nights I would get so scared from these “whispers” that I would sleep in my mom’s bed with her. It was an added bonus that the bathroom was directly outside of her bedroom door for my late-night tinkles. I should add at this point that when walking out into the hall to go to the bathroom, you looked directly down the stairs that would lead you into my living room on the first floor (as my mom’s bedroom was on the second floor). On one such night, around Christmas, I awoke and felt the need to relieve myself. I walked out from the door and distinctly heard the phrase “Look!” and to my astonishment, a red light, almost like a spotlight, was cast upon the wall at the very bottom of the stairs. The light had no other source, it was by itself, and I was transfixed by it. Being a little kid, and it only being a few days from Christmas, I KNEW what this light was. IT WAS SANTA!!! How else could he get into my house to know I was being a good boy. I was so excited I began walking down the stairs to greet him, picking up my pace after the second step as it began to creep off the wall and fade into the darkness in my living room. I listened, turned around, and what happened next I am not sure I would believe if someone had told me this same story. After reaching the top of the stairs, I heard a very loud CRASH that sent me running back to my mother’s bed where I jumped straight under the covers and stayed there the whole night. When we awoke the next morning, the poinsettia lights (little Christmas flower lights that glowed red) my mother had put on the railing down the stairs were pulled straight down to the bottom of the stairs, some broken from what seemed like a forceful tear, laying in a single pile. The dry sink in my living room had fallen from the wall. My mother could not explain it! My father was worried we had been the victims of a home invasion. My sister was crying. There was nothing missing, nobody had broken in, there did not seem to be any reason this had happened. And then I saw it, and I kept quiet about it because I was so afraid that I could not force words out of my mouth. There, on the edge of the wooden dry sink which had been facing up, were three indentations where the finish on the wood had been worn, almost as if in a forceful grip. Something down there had GRABBED IT AND THREW IT DOWN. That was what the bang was. I was mortified. After that day I never heard a single voice again. 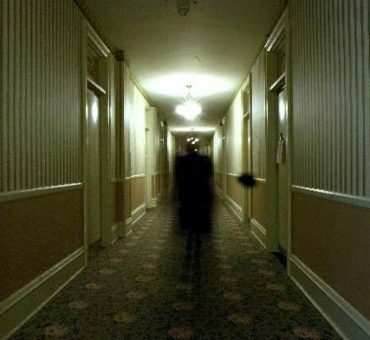 I do not like to imagine what was waiting downstairs for me that night if it was anything at all, but I can tell you that the reality was that something had physically acted upon two things in my house near the bottom of that stairwell. After this, I had never heard another whisper again. Which is sad, because in some ways I would have liked to thank the man (masculine energy?) 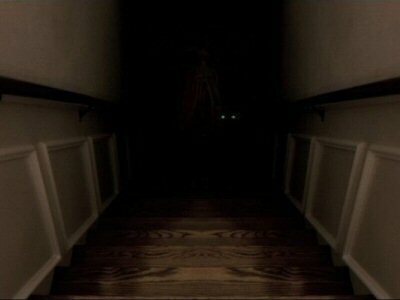 that had stopped me from going down those stairs. This happened when I was 7 (or 7 and a half! as I liked to say at the time). I am 20 years old now, and because of this incident, I am still afraid of the dark. ESPECIALLY shadowy stairwells. I really don’t blame her – I would be afraid of the dark, staircases, dry sinks and red lights! My daughter was born with mild tracheomalacia (soft windpipe). The only “trouble” it ever caused was that she would make a whistling sound sometimes when she was breathing, especially when she was excited or upset. Fast forward to when she was about 4 months old and fast asleep in her crib one evening. Her older brother had the stomach flu that day and had been throwing up. We thought the baby hadn’t caught it. But a little while after we put her to bed, we suddenly heard her softly sputtering on the monitor, then silence for a few seconds, then a HUGE loud wail, which made both my husband and I run even faster to her room. By the time we got to her, she had fallen eerily quiet again. We saw she was gasping for air, choking, unable to clear the vomit from her throat or get a clean breath. Even after we picked her up and cleared her mouth, she continued to gasp. She turned blue, then grey as I drove with her quickly to the ER. She had partially recovered by the time we got there. They gave her o2, chest x-ray, then a clean bill and we left. Fast forward about two hours later when I’m back in my bedroom with her sleeping upright in a baby seat next to me on the bed. My husband and I talked briefly about what would have happened had the baby not cried out so loudly. Would we have reacted so quickly? Would she have recovered? He loved my husband dearly. Extra granddad points for him! Sadly, my sister is very good at denial and told him she didn’t know what he was talking about, took the last of her things from the house, and left. Fast forward 20 years, and we are still not allowed to talk about Suzy and her friend Dissaga and I hope she doesn’t see this and recognize her story. She has also never been informed of the abuse, of what happened to her when she was 5, and we have strict orders to never discuss it with her. So, this one wasn’t as protective as it was friendly and kept the little girl company – but it certainly was creepy. I guess you just never know who is watching out for you…or, just watching you.